Drive yourself into the unknown! The ultimate 4WD adventure. Rugged and remote, the trail ahead disappears into thick native NZ forest. Prepare for a journey that is full of unknowns. 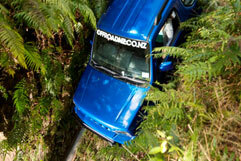 Buckle in and share the driving in one of Off Road NZ’s 4WDs. Your professional guide, up ahead, gives you instructions while your heart is racing with anticipation. The terrain is like nothing you’ve encountered before and the challenges come thick and fast! As you traverse unbelievably steep climbs and descents; tight, twisting bends; deep, muddy holes; the 4WD rocks and pitches. Foliage brushes past… you come to a bridge of poles over a creek – how can you possibly get across that? And suddenly the luge: a six metre-high controlled slide down a near-vertical 80-degree slope. Adrenaline pumping, you try not to look down. Follow instructions and take a leap of faith! Off Road NZ is a sustainable premium adventure experience, creating fun memories, personal growth and lasting impressions. 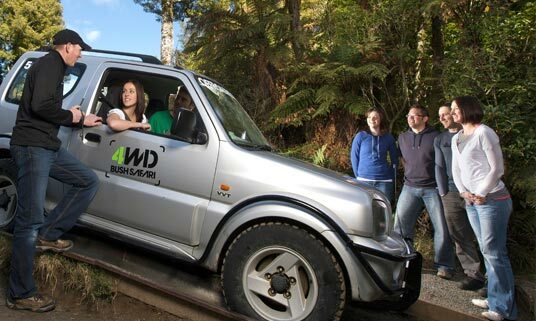 Established in 1992, Off Road NZ provides the best self-drive off road vehicle experiences of their type in New Zealand, including Monster 4X4 Thrill Rides and Karting.